In the world of web browsers, the big names reign supreme. Firefox, Chrome and IE do tend to have all the press and hog the limelight to the point where it’s very easy to overlook the less popular browsers. 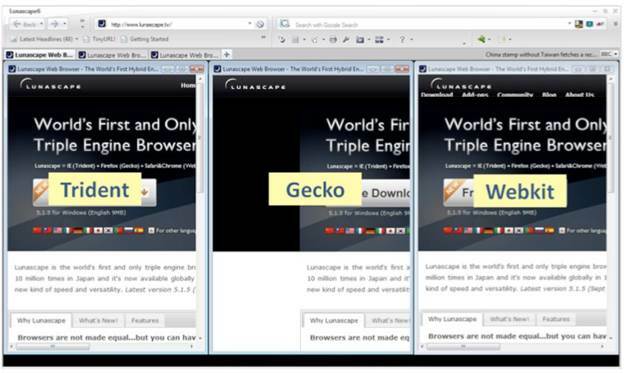 Lunascape is one such browser, which is a shame, as it’s quite an impressive program. We thought it deserves a bit more of a mention and it was about time to let this browser shine. If you’re into eh market for an alternative browser, then Lunascape is quite a surprising find. First off, it’s the world’s first triple engine browser, which means that it has Internet Explorer’s Trident, Firefox’s Gecko, and Chrome’s Webkit engines all rolled into one browser. 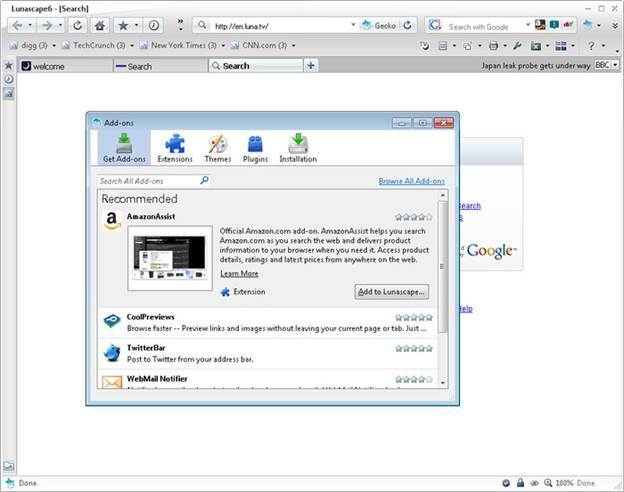 And secondly, it supports Firefox and IE’s vast array of add-ons. It has Internet Explorer’s Trident, Firefox’s Gecko, and Chrome’s Webkit engines all rolled into one browser. Obviously having the triple engine thing means that page displays are no longer going to be mismatched, as every page online is more or less designed with one of these engines in mind, so essentially it also means that there’s room for the future of web technologies to fit snugly in. Is all that technology necessary, though? However, putting this much technology into a single browser comes at a slight cost. The installer is a not too considerable 16.5MB but then expands into 155MB while it resides on the drive. 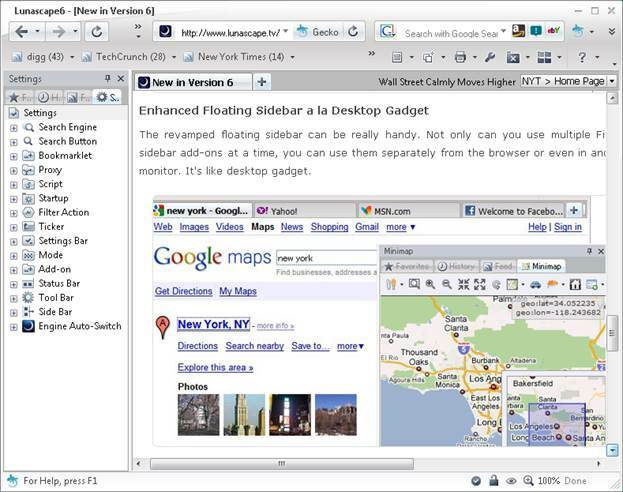 There is a scaled down version, called the Standard Installer, which only includes Gecko and Webkit engines when they’re first used and, to be honest, unless you are a web developer or someone who needs to check any inconsistencies between pages viewed across the main browsers, the triple engine thing becomes a little confusing. This does beg the question, though, as to how useful the super-duper extra features and fancy bits are in Lunascape and, to be honest, unless, as we’ve already stated, you have a need to use the different engines, you could quite easily go about your day-to-day browsing without bothering which engine your web viewing is currently running on. As far as is concerned, we found Lunascape to reasonably quick, although not as quick as a bare installation of Chrome or the popular Maxthon, but it’s still pretty good considering the extra weight it’s packing. In fact, the more we used Lunascape, the more we came to like it and the more we found that page loads across the broad spectrum of differing web pages did tend to come across as being faster overall than Firefox or even Chrome. We’re guessing this has something to do with the multi-engine thing; either way, Lunascape found its way onto our list of favorite apps. Despite our moan, Lunascape is a solid browser. It’s still faster than IE, even with all the triple engine work going on in the background, and it would make an ideal addition to most users’ desktops. To get hold of the latest version of Lunascape, visit goo.gl/fYjnJ and enjoy. · Auto-switching triple engine thing, which sounds cool. · Highlighted quick search function.